We are pleased to announce celebration of WORLD YOGA DAY from next week starting on 19th June to 25th June 2017. Yoga helps us to unite mind, health and body to have happiness and wellness when we do perform yoga, We are connected to spiritual World through Pranayam and Meditation. If we apply pure potentiality through meditation to sit alone in silent every day regularly morning and evening. Connect and commune with nature and to silently witness the intelligence within every living things. We shall watch and appreciate natures great gift to mankind to the world, watch a sunrise and sunset or listen to the sound of the ocean or stream or simply smell the scent of a flower. In the ecstasy of my own silence and by conserving with nature. We shall enjoy the life throb of ages, the field of pure potentiality and unbounded creativity. We all are karma yogis therefore every action generates a force of energy that returns to us in the kind, what was sow is what we reap. And when we choose action that being happiness and success to other, the fruits of our Karma is Happiness and success. 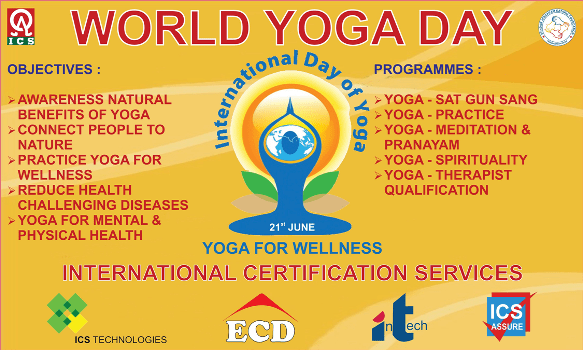 Enclosed herewith ICS Greetings on the “WORLD YOGA DAY’ to be send to all our valued customers, business associates and stake holders to make the WORLD YOGA DAY a great success.